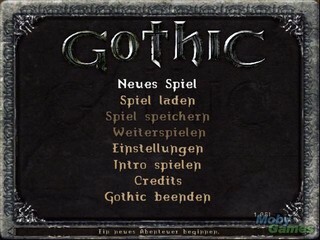 Released in March 2001 by Piranha Bytes, Gothic is an action role-playing game. The player is prisoner a tasked with escaping from a mining colony sealed off from the rest of the world by a magical barrier, and ending a war against the Orcs. Gameplay involves hack-and-slash combat, a magic and skills levelling system and a faction-based quest system. Best 100% time: 2:48:08 by 'Blubbler' on 2013-01-26. Best time with large-skip glitches and with resets: Single-segment 0:16:28 by 'Blubbler' on 2013-07-05. 100% 2:48:08 by 'Blubbler', done in 306 segments. In this 100% run, I finish with small exceptions all the quests incl the sidequests and guild-related quests in the game in a single playthrough joining each of the three camps along the way. For a quest to be "finished" it first has to be "running". If you finish a quest before actually receiving it, it won't appear in the quest log and cannot be finished anymore at all. To make it more visible when I get, finish and fail quests I put annotations on my youtube upload. When a quest has its status changed a box pops up with the name of the quest. If the box is grey, it is "running", if it is green, it is "finished" and if it is red, it is "failed". - "Xardas the Necromancer" & "The Sleeper Awakens"
These quests simply cannot be finished. There isn't a function anywhere in the game to do that. - "Admission ot the Old Camp" & "Admission to the New Camp"
The reason I fail two of the three Admission quests is that when you finish one of them the other two fail automatically. So I am fairly certain that even if you discover more extreme glitches this quest count is the maximum. So the first thing you notice is that "The Big Thing of the Brotherhood" is a quest for both the Old Camp and the New Camp. It was supposed to be two seperate quests, but due to a glitch they're the same and even if I got them both, they would share the same entry in the quest log. So the New Camp offers nothing in terms of quests you can't get elsewhere. Now what I do is join the Old Camp and get "The Big Thing of the Brotherhood". Then in the 4th chapter I change over to the Swamp Camp and get the two Swamp-Camp-only quests. Since I was a member of the Old Camp at the beginning of chapter 4 I got banished from the Old Camp and that means I can change over to the New Camp and finish "Banishment from the Old Camp". So I get them all. But how do I change to the Swamp Camp in chapter 4? Normally you join the Swamp Camp in chapter 1 as a guildless player by talking to Cor Kalom. I do just that but in chapter 4. If you're a member of the Old Camp, you get banished in chapter 4 and then are guildless and thus able to join the Swamp Camp theoretically. Theoretically because by that point in the storyline Cor Kalom has already vanished (and no the other Cor Kalom during the final fight does not let you join the camp). Or he should have vanished. I just "carry" Cor Kalom around with me by repeatedly hitting him with a spell called Wind of Fist that pushes him away from me. I do this from the start of the 3rd chapter to the beginning of the 4th chapter, because as long as I stay within Cor Kalom's AI range the game will not remove him. How do you jump in mid-air? If you press M the map is supposed to be opened. But if you have no map in your inventory, you simply stand still in mid-air and can jump repeatedly. I hold down Alt and the up arrow key and press M whenever I want to jump. That's also how I survive big falls and quickly undraw weapons. Why isn't the strength potion used up? You get the effect of a potion immediately, when you start drinking it. But the potion is only removed at the end of the drinking animation. Since I get interrupted by molerat attacks, the animation isn't finished and the potion isn't removed. How do you walk through walls (e.g. in the Old Mine or in Y'Berion's temple)? It is possible by rare random chance to just strafe through a thin object, if you stand in the corner and strafe repeatedly. In Y'Berion's temple the walls aren't properly connected, so you can just go through quite easily. What do you collect the experience for? To join a camp I need level 5. Since I intend to later change over to the New Camp, I have to become a guard or magician of fire too, which requires level 10. To minimize walking, I do both at once and surpass the needed experience by only 15. After that it is irrelevant. Why do you lure Gorn to the Monastery Ruin and Lester to the Mountain Keep? Why do you shove Cor Kalom to Milten and Diego? To have the 4 quests with the friends of the focus search like "Focus in the Monastery Ruin" in the quest log, it is not enough to simply deliver the focus stone to Saturas. You also have to talk with each friend at the appropriate location to even have the quest running. Since in chapter 3 I have to carry Cor Kalom around with me, I try to deal with it before. Sort of Diego all the friends react to the waypoint where you talk to them and not the progress of the story, so you can make parts of it earlier by luring them there. How do you go out of bounds in the Monastery Ruin? You always shift your position a bit, when you transform into an animal or back. Since the piece of wood extends outside the game world, I can also be shifted there. Why do you visit Xardas in chapter 1, but talk to Ur-Shak only in chapter 4? Why do you get the Ulu-Mulu so late in the game? Why do you visit the Temple of the Sleeper that late? While I spawn Ur-Shak in chapter 1, he can only be talked to in chapter 4. I visit Xardas mainly for the golem hearts. The Ulu-Mulu quest is started by Ur-Shak. So I have to talk to Ur-Shak before receiving the Ulu-Mulu to have the quest in my log. As soon as you enter the Temple of the Sleeper Xardas loses interest in Ur-Shak and his quest is unsolvable. Why do the Chromanin books appear in the Free Mine? The game tries to spawn them at the right location, but since I'm in another instance, it can't find it and it defaults to the (0,0,0) position, which is very nice in the Free Mine. Sadly spawning the corpse carring Chromanin 6 this way is impossible. Why do you load an old save at the end of the game and why does it have an effect? I open the menu exactly as I am being talked to by Gor Boba. When I load a game then, I am stuck in dialogue mode and can neither be attacked nor talked to anymore. This trick is only useful for the last segment of the run since saving or canceling this glitch is impossible. If you have any questions or need help doing a or want to collaborate on a Gothic/Risen series speedrun, message me at SDA (Blubbler), WorldofGothic (Blubbler), Youtube (LordSaradoc) or Skype (iranoutofnicknames). Single-segment with large-skip glitches: 0:16:28 by 'Blubbler'. If you simultaneously press jump, up and M (the map key) in mid-air without having a map in your inventory, you will do a jump. If you hold all these keys down, you get stuck in the beginning of the jumping animation, which is sometimes helpful and looks like you are sinking into the ground. The map key also makes you not receive fall damage. To end this game, you need to banish the Sleeper. To do that, you must collect the swords from each of his five priests (after killing them). The way into the dungeon is supposed to be blocked until late in the game, but there are several ways past the barrier. The only detour in this run is to open a chest, which gives me some magic scrolls, which help me pass some barriers in the dungeon faster. The skeletons in this room are by default hostile to the priest. So you only need to let them live and have them attack him instead of you to win the fight without doing anything. I save and reload to reset the aggressiveness of the skeletons and turn the switch to summon the priest. When he attacks me, I sink into the ground to dodge his attack and let the skeletons do the work. This priest will (unless you are not too close to him) approach you before he draws his weapon. If you save and reload at the right point of the weapon drawing animation, he will draw his staff, but use it as a melee weapon instead of doing magic. I then jump past a trigger that would have lowered a gate and lure him in his own trap. The trap does not do enough damage to kill him immediately, but the damage is reapplied every time I load. At the end I jump past the trigger again. Would I touch the trigger, I would have to go down to the trap and activate a switch. This is imho the most impressive part of the run (if you know what is going on). The priest kills you almost immediately, when you get into his range with no chance of survival whatsoever at level 0. Previous speedruns would lure a monster near him that would knock you unconscious until the priest walks out of range. Here is do a jump so I end up in range, but not in sight. I then do a jump into his sight and save and load in midair. This way I skip him walking up to me. Now I sink into the ground, which for some reason makes him charge forward blindly. I can run past him and save and load to make him stop running. On the altar in the middle of the room, there is a spot, where a pillar descending from the ceiling will kill you, if you stand there too long. I go into a corner and sink into the ground again to make him charge forward. When he is under the pillar, I save and load to make him stop running and get killed by the pillar. I use a Fire Bolt scroll on the priest that does no damage, but lures him into his own trap. Then I activate the trap and kill him. This priest does not immediately attack you, but instead just warns you to leave since you're weapons are too weak to harm him. I get him to fall into a pit and die. Before going into the fight I load an older save, get into a dialogue and open the menu at the same time. When I load a save now, I am still in dialogue mode and nobody can attack me or talk to me. So the "fight" is just walking from one shrine to the next.